the stall with no name yet returns …. Today we start the stall that was perviously called ‘dekhomai’ at the Gillingham Boot Fair. The team has grown a little. As with last year we are offering prayer for healing, Psalm Readings, Jesus Deck readings, blessings and Ruach Insight readings. I addition to this we are simply a group of people that believe in God, and come from a Christian tradition, who wish to welcome and be good news for people that we meet. As well as being excited, I think we are all a little nervous. We have taken on a big commitment to have a presence here for around 12 weeks. That is 12 weeks of getting up at 5am on a Sunday morning to set the stall up at 6am when the boot fair opens. We then work until 12 before going home. Jesus Deck readings … you can see these here. We ask people to choose a card, look at the story from one of the gospels together and see if that resonates with the person in any way. We then offer to pray for them. Ruach insight readings … Liz and myself hd training in this only last week … but we think this will work well in the boot fair setting. We shall see and stepping out means trying new things to see how they work. We will be looking at cards, asking if anything resonates or clicks with the person. At the end we will offer to pray with them. 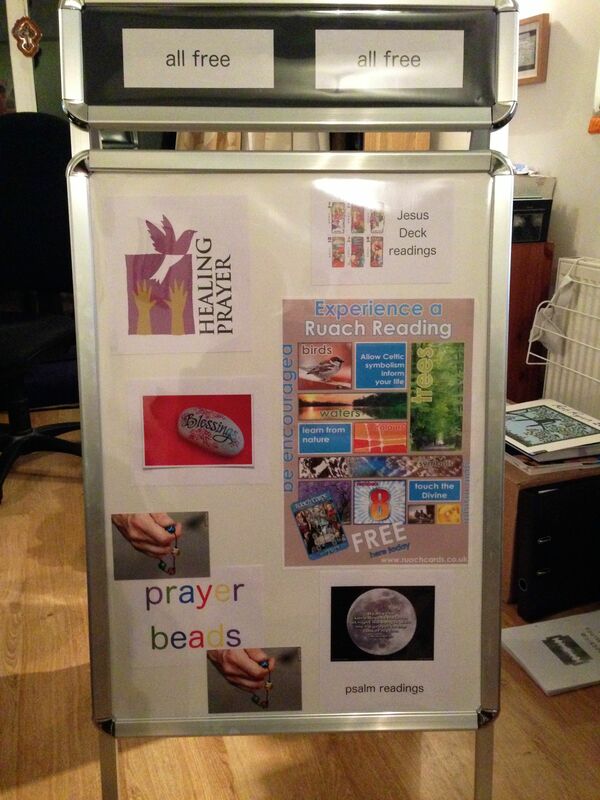 Psalm readings … we have short quotes from psalms printed and laminated on different coloured card the size of a credit card. Each of these is placed upside down on a table and weighed down by a different stone or piece of pottery. We ask people to choose a card or stone they like the look of …. and then we read the psalm together, and ask if anything strikes or resonates with them. Then we offer to pray for them. Prayer Beads … a card explaining this can be seen here. Guess what …. when the person has made the prayer cord we ask them if they would like us to pray for them. Blessings … we are using John O’Donahue’s book of blessings. I have bookmarked some blessings such as ‘for a mum to be’ or ‘a new job’ or ‘for courage’. We ask the person to chose a blessing they would like from the book and then we pray that for them, offering to anoint them with oil as well. That already includes prayer. I think prayer for healing is quite self explanatory … and we will be offering to pray! You may have picked up the pattern that we offer to pray … we are also the only stall there that is not there to make money … everything we offer is free. That’s quite an important concept to us, as anything we give os from God … and God doesn’t charge for that so how can we! So … please … if you do pray … this morning please pray for this team venturing out to serve people. Better still, if you are nearby … please come say hello, see what we are doing, have a reading , buy us tea and bacon …. or whatever. This entry was posted in boot fair, Boot Fairs by robryan65. Bookmark the permalink.